It took the New York Jets longer than they expected or wanted, but they finally have signed their future quarterback Sam Darnold after he signed his rookie deal on Monday. Darnold tweeted a video after signing calling the moment very special and added that he was very excited. The Jets first-round pick in the draft signed a four-year deal for $30.2 million. The contract, which includes a signing bonus of $20 million, is one of the richest in team history. By NFL rule, the contract Darnold signed is fully guaranteed and has a standard club options for a fifth year. Darnold left the locker room at 2 p.m. and headed to the practice field where his teammates welcomed him by slowing clapping as they began their stretching. 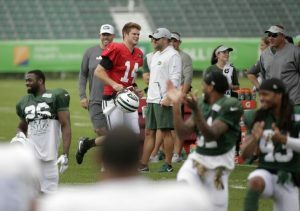 Josh McCown, the current starter at quarterback, welcomed Darnold with a shake of the hand and a light head slap. Jets head coach Todd Bowles welcomed Darnold by telling him he was late to practice. The delay in signing a contract that already had a predetermined amount was due to both sides negotiating over clauses and the deal’s language. The contract has language, which was wanted by the Jets, but was part of the delay the past few weeks. New York agreed to change its position on the contract’s default language with regard to guaranteed money, which was the biggest problem. Darnold forfeits guaranteed money if suspended by the league, but not if he is fined. Darnold is the first top-five NFL pick to get the bonus in a lump sum at signing. The Jets guaranteed his roster bonuses for 2019, 2020 and 2021 even if he were to start camp on the team’s non-football injury list. In all, 256 players were drafted and Darnold became No. 255 to ink a rookie deal. The one remaining unsigned pick is Roquan Smith a linebacker drafted by the Chicago Bears. Smith was the eighth pick overall in the draft. Darnold, who played college ball for USC, will compete for the Jets’ starting quarterback spot during training camp. He will be competing against McCown and Teddy Bridgewater the former starter with the Minnesota Vikings before a devastating knee injury sidelined him the better part of two seasons. Coach Bowles called McCown his No. 1 QB and said the others would have to beat him out to take his spot.